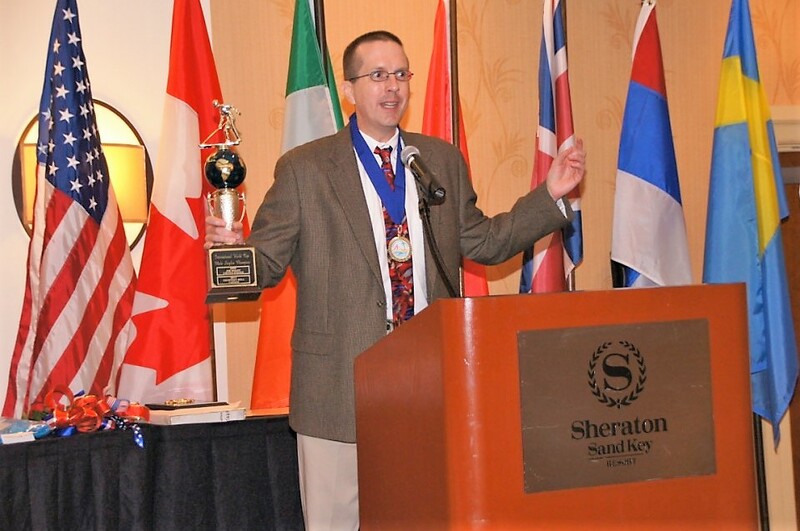 ← Every Shuffler, repeat, Every Shuffler Should Attend At Least Once, The US Nationals in Lakeside, OHIO. 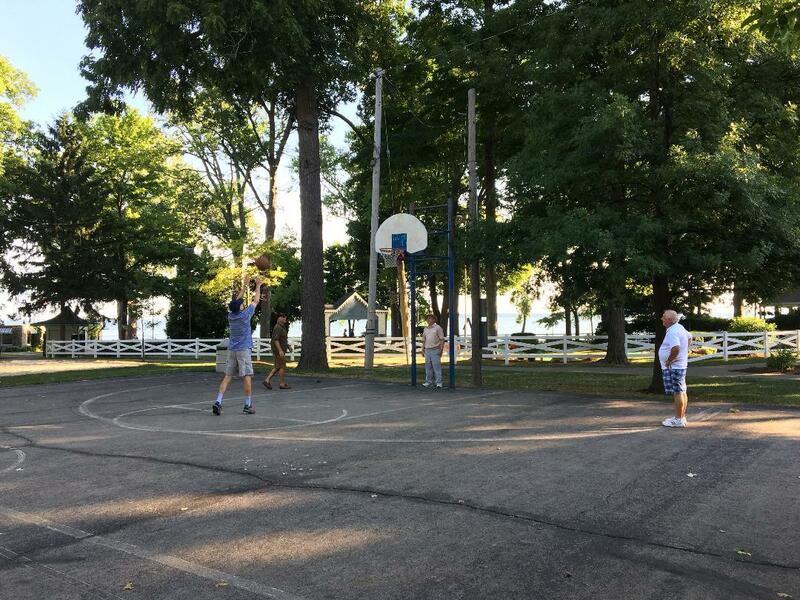 Sam Allen, Bob Hoskins, Larry Mardis, and Levi Miller warm up for National Doubles with a free throw shooting contest in Lakeside’s Central Park. 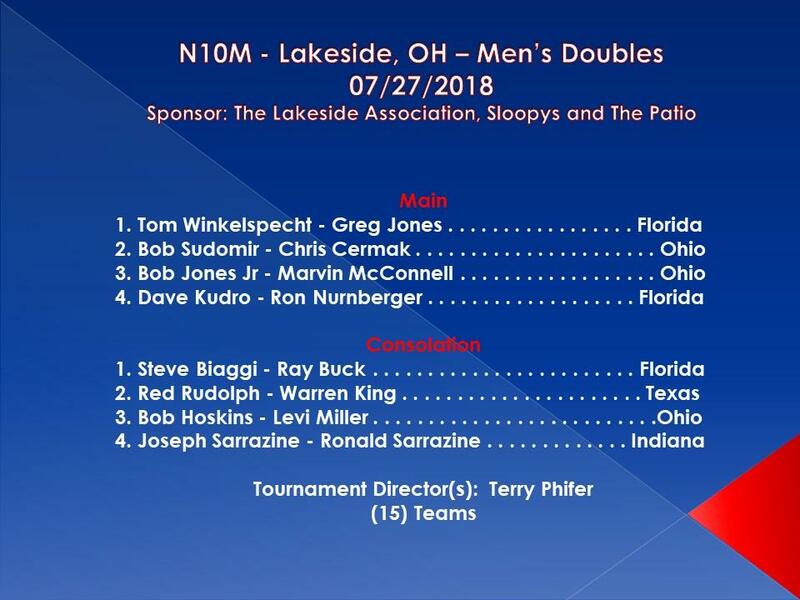 Bob Jones Speaks: On Thursday July 26, 2018, as the field gathered for the Lakeside National Mens Doubles, observers noted multiple world champions, more than 50 previous national championships, Florida Masters, members of National, Florida, Ohio, and Texas Hall of Fames. For two incredible days, fans in the crowded grandstands discussed strategy and “oohed and aahhed” as they enjoyed the high level of competition and camaraderie. Underdogs Tom Winkelspecht and Greg Jones ran the daunting gauntlet and emerged as champions and earned their national pin. In their semi-final and finals, they recovered from a lopsided first game loss to win close second and third games. In the third game of the finals, playing against seven time winners Bob Sudomir and Chris Cermak, both teams in the mid 50’s, court with a 3-7 inch drift, Greg made a championship worthy shot as his hammer went between two high blocks separated by 7 inches and made a 15 point double by hitting his own disc on the 8-8 line. At the foot, Tom calmly made the winning hammer. We hope to see in Lakeside in 2019! -Lary Faris National Singles July 15-17, 2019, men, women. -Lary Faris National Junior Singles, July 17, 2019, boys, girls age 15 and under. -National Doubles, July 18-19, 2019, men, women. Thanks Bob . . great article!! Well written article. Excellent use of wording to incite excitement and the desire to read on. Good to see someone writing for Ohio.